Diamonds R out-finished Bella Mia through the stretch and notched a one-length victory Sunday in the $50,000 Irish Day Stakes for 3-year-old fillies at Emerald Downs. With Leonel Camacho-Flores riding at 117 pounds, Diamonds R covered 1 1/16 miles in 1:42.96 on a fast track and paid $28.20, $9 and $4.60. Tom Wenzel is the winning trainer for owner Dr. George Todaro of Seattle, who also celebrated a birthday Sunday. A Kentucky-bred by Alternation, Diamonds R was coming off back-to-back fourths in the Seattle Stakes and Kent Stakes, and improved dramatically on the stretch out. Her overall mark is 3-0-0 in eight starts with $62,563 in earnings, including $27,225 for Sunday’s victory. Diamonds R stalked Bella Mia and Ima Happy Cat through a half-mile in :46.79, slipped through inside to challenge Bella Mia into the lane, and gradually put away the 4-to-5 favorite in a stretch-long battle. Bella Mia, ridden by Julien Couton at 123 pounds, held second and paid $2.60 and $2.20. It was the first career route for the four-time stakes winner, whose career record is is 5-2-0 in eight starts with earnings of $138,488. Princessof the Nyl, second choice at 5-2, rallied belatedly for third and paid $2.40 to show. Kevin Orozco was aboard at 117 pounds. Downwind, Assemble and Ima Happy Cat rounded out the order of finish. Ca Dreamer was a late scratch. The $50,000 Washington Oaks at 1 1/8 miles is next for 3-year-old fillies on Sunday, July 22. Todaro was at the opera Sunday and missed the race. With Todaro away, racing manager Bob Capelletti represented the owner at Emerald Downs. … Wenzel is No. 6 all-time with 40 stakes wins at Emerald Downs. … Camacho-Flores has five career stakes wins at EmD, and the victory aboard Diamonds R snapped an 0-for-48 drought dating to May 28. … Camacho-Flores also scored a $54.60 upset Sunday on Jerre to Carrie in the $20,500 allowance/optional claimer for older fillies and mares. Kay Cooper trains Jerre to Carrie for owner Richard Caswell. … Patti Benson of Gig Harbor won a drawing for an all expenses paid trip for two to Dublin, Ireland, courtesy of Aer Lingus. … Mike Man’s Gold ($8.40) took over sole possession of second place on the track’s all-time victory list with an 8 1/4-length score in Sunday’s seventh race. 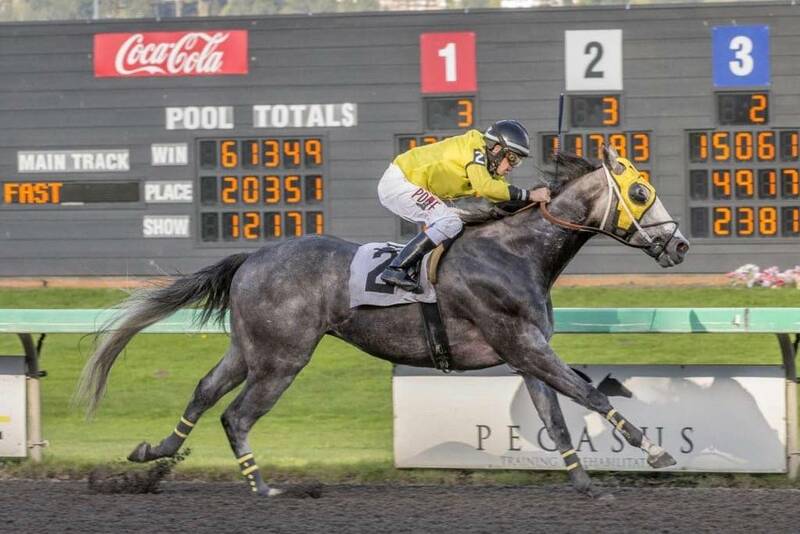 It was the 18th EmD victory for the 8-year-old gelding, second only to West Seattle Boy’s 21 wins at EmD. … First-time starter My Grandpa ($5.80) nailed Fuzzy Dolphin in the final stride to win Sunday’s $18,500 maiden special weight for 2-year-old colts and geldings, running five furlong in :57.89. Eswan Flores rode the Washington-bred by Grazen for Wenzel and Ron Crockett Inc. … Rocco Bowen rode three winners Sunday, boosting his season total to 48 wins in 30 days. … Camacho-Flores and Gary Wales rode two winners each. … Wenzel and Manny Ortiz led the trainers with two wins apiece. … Live racing resumes Tuesday with a nine-race card followed by the Fireworks Spectacular. First post is 5 p.m., and includes carryovers of $16,943 in the $0.50 Pick 5 and $14,911 in the $0.20 Pick 7.